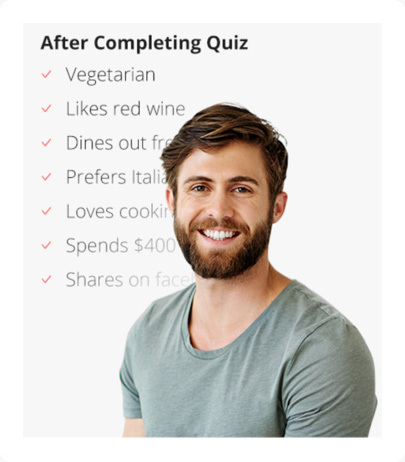 Generate More Qualified Leads with Quizzes. Get Up to 5X more leads! 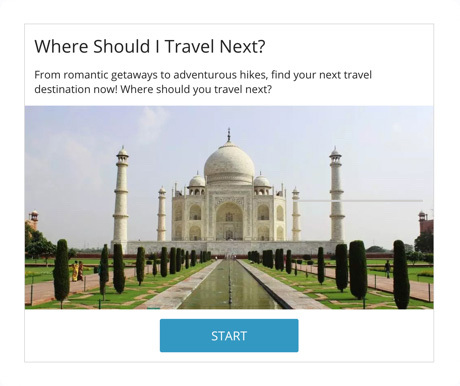 Integrate a lead form inside a highly engaging quiz to get more leads. 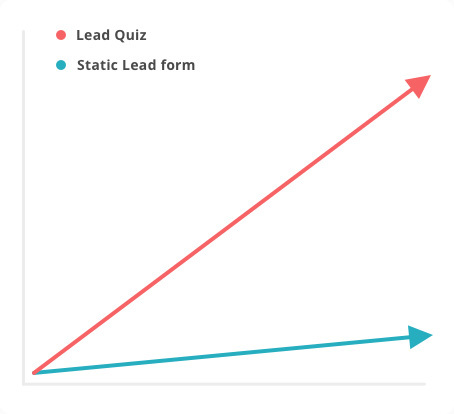 Lead Quizzes generate up to 500% more leads than standard forms. Getting user answers associated with contact info lets you qualify your leads as you gather them. Select an appealing topic & visuals to attract participants. It is important to understand who your audience is to verify the quiz question you ask will result with high participation rates. Ask questions that will help you qualify participants, so that you know which ones offer higher value for you. You can then decide to follow up only with high potential leads or to follow up in a different way based on their answers in the quiz. Ask users for their contact details just before they get their results. Since the users are invested in your quiz, you can expect to get up to 5 times more leads then you would using a standard contact form. 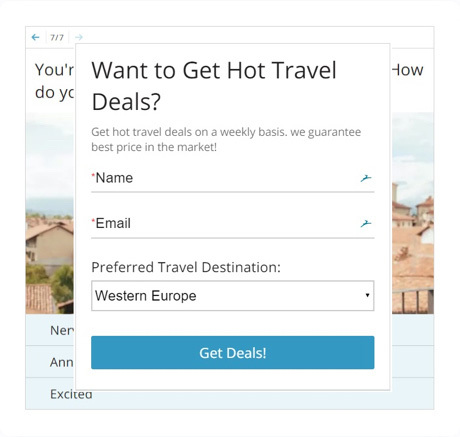 Offer users something in exchange for their contact info to further increase conversion rates. 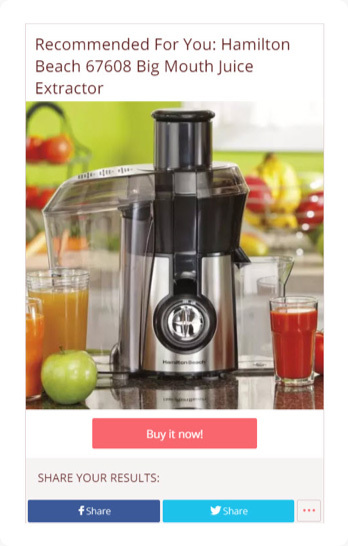 With the result, display a customized offer with a call-to-action. You can select between displaying a call-to-action button and redirecting to a customized landing page based on the result the user gets. 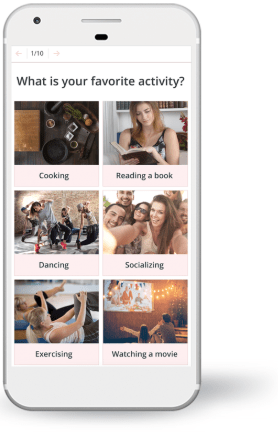 Quizzes are one of the most engaging types of online content. 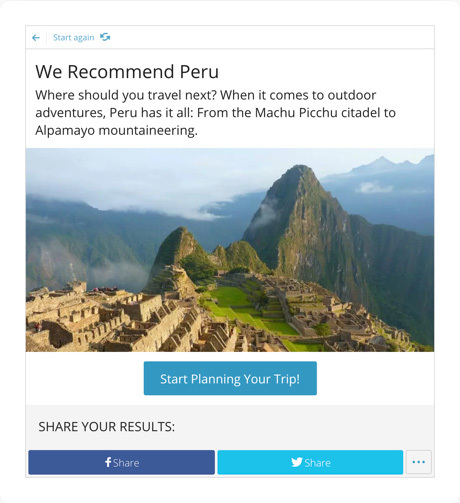 Highly crafted quizzes can get 80%+ participation rates & 90%+ completion rates, exceeding any other type of content. 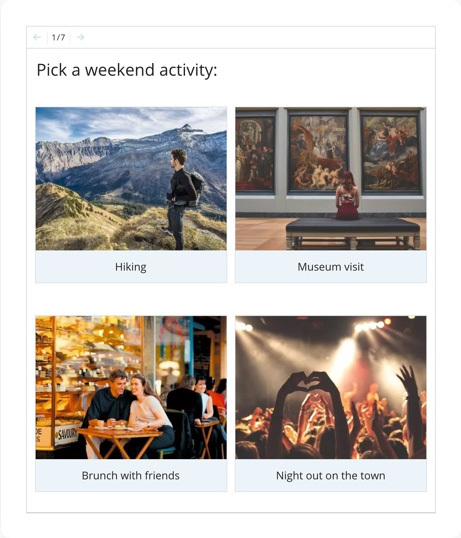 By asking questions, and getting user feedback, we can lead the user to a highly personalized experience, and offer a service or product that is highly relevant to each user. Users engaged in highly personalized content, are much more likely to submit their contact information. Expect up to 500% more leads compared with standard contact forms. Leads you get will be associated with the answers of the users and the outcome they get. Using the correct questions / outcomes you will be able to fully qualify the leads you get.